The recent revelations around the disposal of surplus in the fashion industry have been shocking, not simply for the methods used – more on which later - but for the sheer volume of stock involved. In a world where the top fashion houses exist on a constant cycle of fashion weeks and seasons, filtering down to a high street where many chains are receiving multiple deliveries per week of new styles, it’s clear to see that supply is vastly exceeding demand. Reports continue to surface of designers preferring to destroy millions of pounds worth of excess stock rather than have it sold at a discounted price (or perhaps donated to charity) because, of course, the exclusivity of the label must be protected…and with it, their profits. But, let alone the environmental impact of this level of waste, if we can take a garment that retails at thousands of pounds and burn it because the seasons have changed and it’s no longer in fashion, what does that say about our connection to the item, our respect for its makers and the resources taken to produce it? Herein lies one of the main problems, at the root of many, when it comes to fast fashion. There’s simply no love there. It might be fun to change up our style on a daily basis and, in the age of social media, it’s become almost taboo to be pictured in the same outfit twice (thank you, celebrities and Instagram! )… but, answer honestly, when was the last time you picked up a mass-produced piece of clothing from a high street chain and genuinely fell in love? The reason for this is simple - it’s difficult to feel a connection with mass-produced items. When you pick up a handmade garment at a local shop, the chances are that the shop owner can tell you the story of that piece – where it’s come from, who made it and where they sourced their materials. You can feel the craftsmanship and care that went into creating what you’re holding and you can respect it. You will treat that item with a kindness and consideration that just wouldn’t apply to something mass produced…and, because of all of this, you can love it. Once you have this relationship with your clothes the idea of disposable fashion goes straight out of the window. After all if you love something, you feel good in it, so why wouldn’t you want to wear it again and again? Of course, this doesn’t need to mean looking the same every day. Buy different pieces, build a wardrobe that you can mix and match with items that complement each other and get creative with accessories – we all know how changing the jewellery we wear with a favourite dress can change the look of our outfit, but why stop there? There’s a whole world of shoes, belts, brooches, bags and scarves out there too! 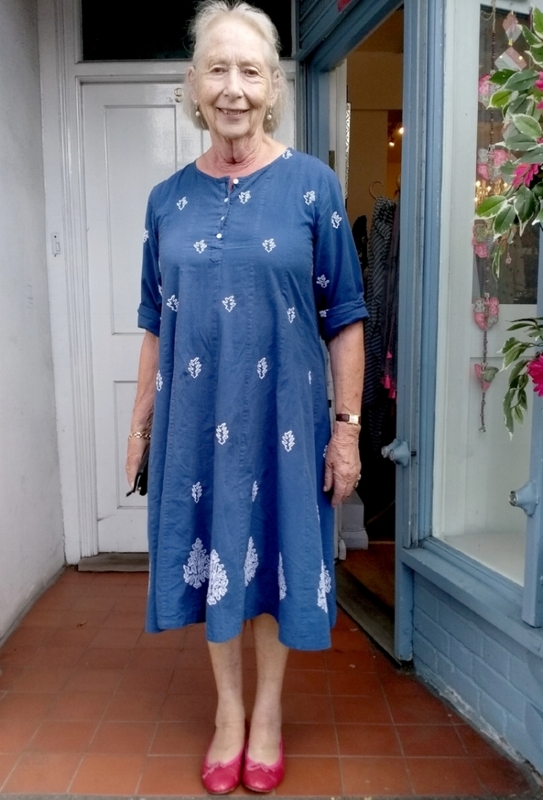 Be brave when you enter the shop – test out a new look, venture away from the current trend, try on those beautiful garments that catch your eye but you’ve always felt you couldn’t pull off... most importantly, talk to the shop owners and assistants. They know their stock better than anyone and in local stores with handmade garments, they’re passionate about what they’re selling. They can help you to find the perfect outfit that you might not have spotted, telling you the stories of the garments along the way, helping you to find ‘the one’. And finally, when you’ve found that perfect piece - special, because it will only be made in small quantities - and you take it up to the cash register to pay, this garment may well have a higher price tag than you would find in those high street chains… but remember what you’re paying for. You’re not only paying for the beautiful, individually produced item that has captured your heart, you’re paying for the story behind it, for the care it was made with, for the dedicated work that has gone into it – from the hand-weaving of the fabrics to the seams sewn by people, not factory machines – and, most importantly, you’re paying for it fairly. These labels aren’t employing factory workers on a ridiculously low wage, keeping production costs low and then hiking up the retail price just by being a designer brand… no, they’re employing skilled craftspeople at every stage, compensating them for their time and skills, in a way that should be the norm – but sadly isn’t. So maybe it’s time for a new normal, one where we buy items that are going to last, that we’re going to treasure and wear all the time because we love them… a normal where we know where our clothes have come from, what they’re made from and how… and a normal where everyone involved is treated fairly, from pay to conditions, and with the same care that they have shown to producing the wonderful garments we’re buying. So, let’s end this fling with fast fashion and allow ourselves to fall truly in love with sustainable style.